It’s homecoming for the Durant Dogies when Cord Lynear, a Mormon “lost boy” forced off his compound for rebellious behavior, shows up in Absaroka County. Without much guidance, divine or otherwise, Sheriff Walt Longmire, Victoria Moretti, and Henry Standing Bear search for the boy’s mother and find themselves on a high-plains scavenger hunt that ends at the barbed-wire doorstep of an interstate polygamy group. Run by four-hundred-pound Roy Lynear, Cord’s father, the group is frighteningly well armed and very good at keeping secrets. 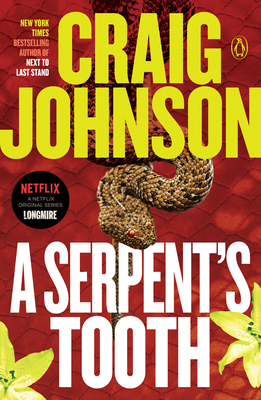 Craig Johnson is the New York Times bestselling author of the Longmire mysteries, the basis for the hit Netflix original series Longmire. He is the recipient of the Western Writers of America Spur Award for fiction, the Mountains and Plains Booksellers Award for fiction, the Nouvel Observateur Prix du Roman Noir, and the Prix SNCF du Polar. His novella Spirit of Steamboat was the first One Book Wyoming selection. He lives in Ucross, Wyoming, population twenty-five.